The right size area rug brings order to an otherwise too large or too small room. It can showcase furniture, draws the eye to specific areas of the room, and can make the room feel larger or even feel more intimate. A tip for those on a budget would be to choose large rugs made from natural fibres because they’re quite affordable and can add a lot of interesting details and textures to a room. A large dramatic lampshade, an intricate chandelier, or a huge floor lamp can serve as a focal point while providing illumination to a room. A budget tip would be to check garage sales. This means choosing elevated curtains that are slightly wider than your window to create a posh lush look. You don’t need to buy expensive curtains at all. You can opt for cheap ones and simply use more of them to get that luxury feel. The bigger the artwork, the better! 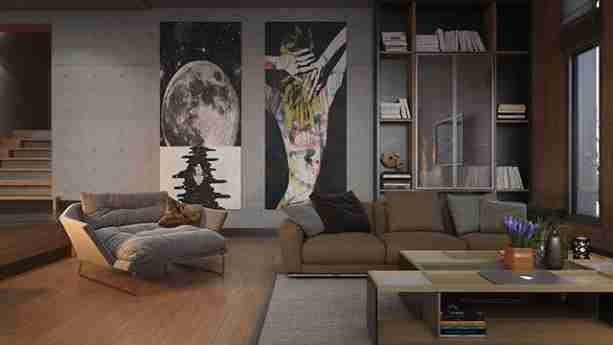 Huge canvasses make a room feel more luxe by creating a gallery feel. Have a look at Etsy or similar sites for budget friendly options that looks like you’ve spent a lot. Pillows and throws in luxe textiles can be quite an investment, but the beauty and ambiance they add to a room make them a good investment. Don’t skimp on the pillow insert either! Feather-down inserts impart an unmistakable expensive feel to your living room. You can create a designer look by adding a few luxury accessories in the room. They don’t have to cost an arm and a leg either, its all in the choice of material and proper placement. For example, you can use a small wall mirror as an alternative to an expensive mirrored tray with a few decorative items on top. Wall mirrors can add more light and detail to your room. The use of one large wall mirror or a collection of small wall mirrors can be an inexpensive wall feature that have a huge impact. A few big decorative pieces such as a sculpture or a big vase will give the room an interesting focal point. If you’re having trouble finding a large piece, a grouping of similar objects will have the same impact too! An example would be a decorative candle arrangement in a corner if you don’t have a fireplace. Want to move in to an Oakville luxury home soon but having quite a difficult time looking for the Oakville home of your dreams? We can assist you! Contact us to get in touch with our team and get to know the Goodale Miller Team experience.